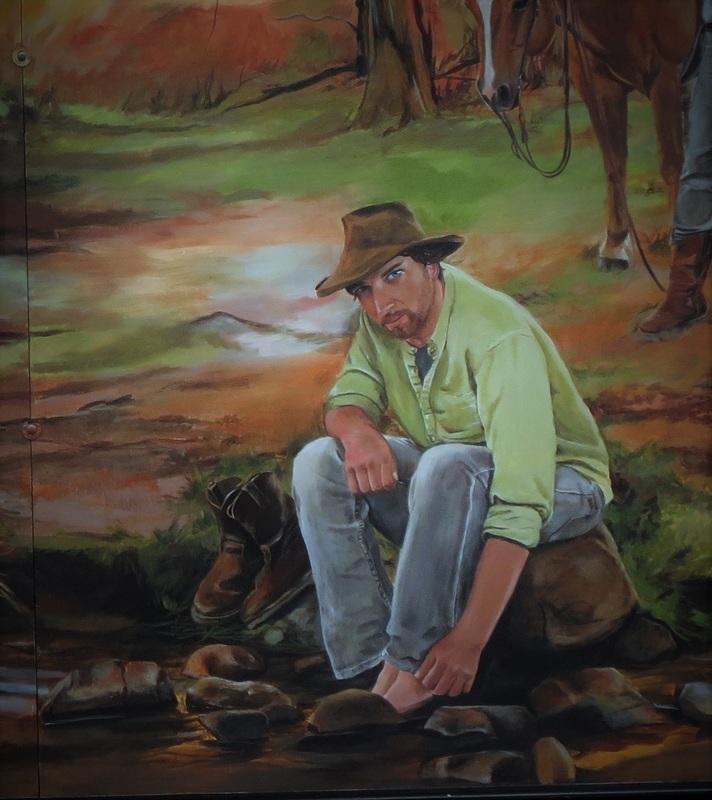 The reference painting for this year's mural: "... 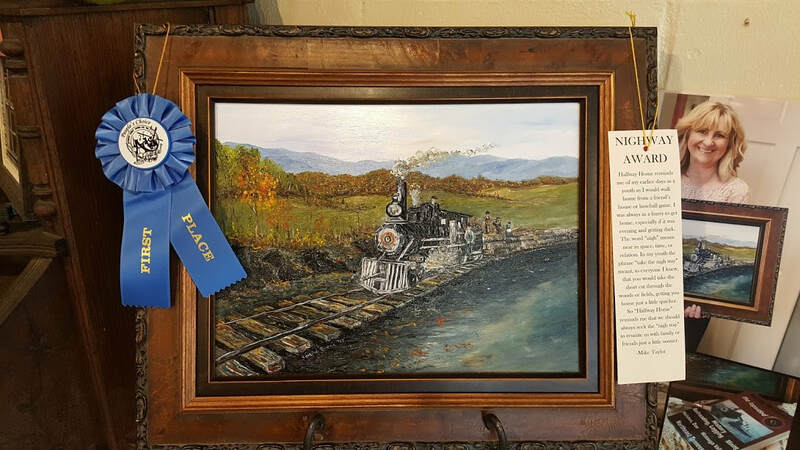 It Surely is a Train" by Temple Reece. 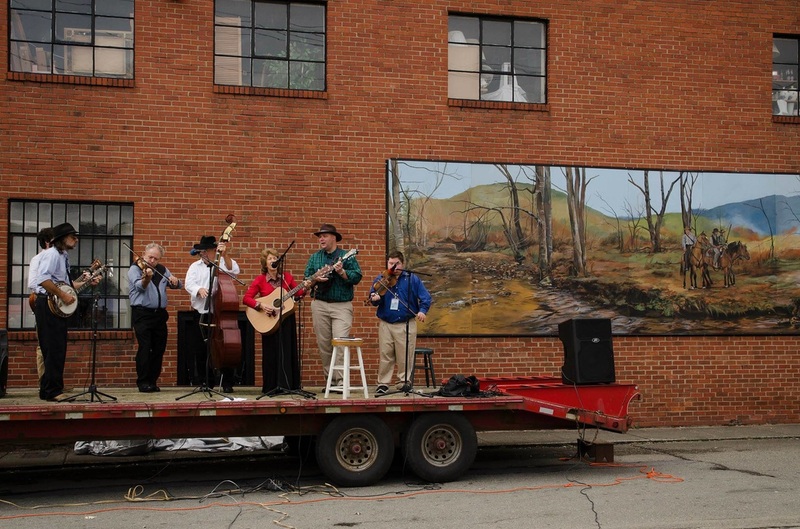 In 2017, a group of 20 mural workshop participants worked together to recreate the photograph from the historic 1925 Fiddler's Convention. 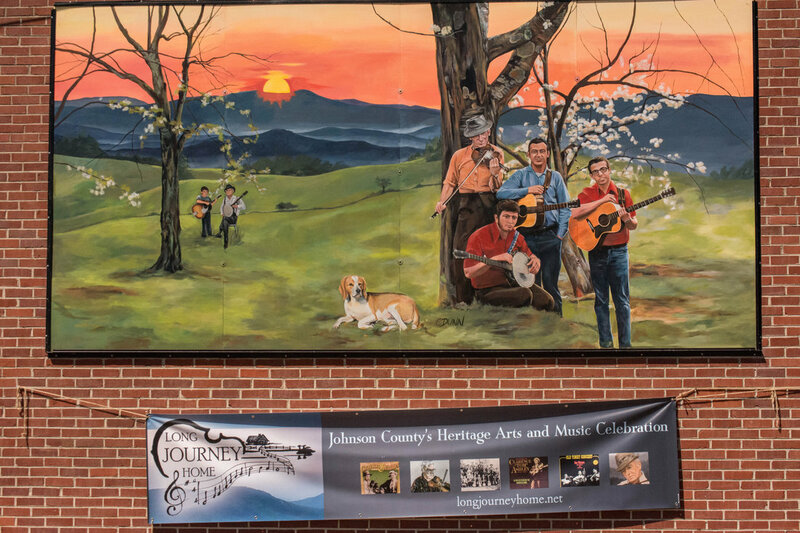 The workshop spanned two weeks and was led by the artist who created the first three of Johnson County's Musical Heritage Murals, Cristy Dunn. ​"Everyone who knew Fred and Clint remembers not only their music, but their legacy of kindness and humility. They were good people who lived authentically, and their music had a way of putting us in touch with the most decent part of ourselves." 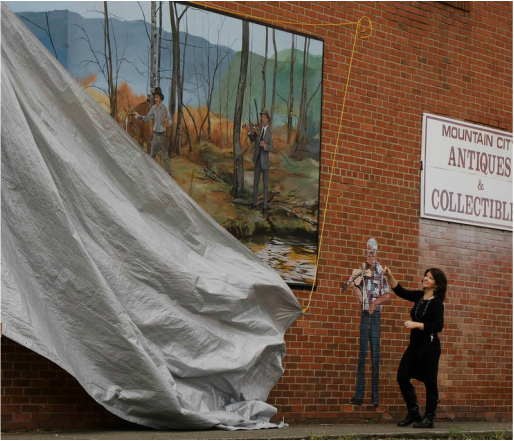 The second in a series of three murals by local artist, Cristy Dunn, was unveiled in downtown Mountain City last Sepember. 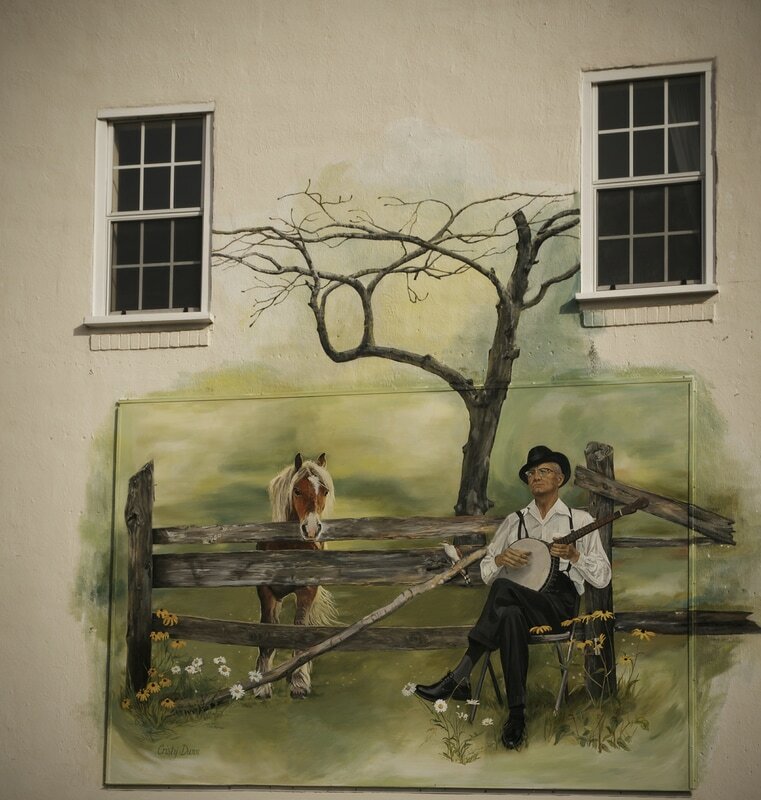 The mural honors early 20th century fiddler, G.B. Grayson, who first recorded the Ballad of Tom Dooley and wrote many of the Old Time fiddle standards we know and love. 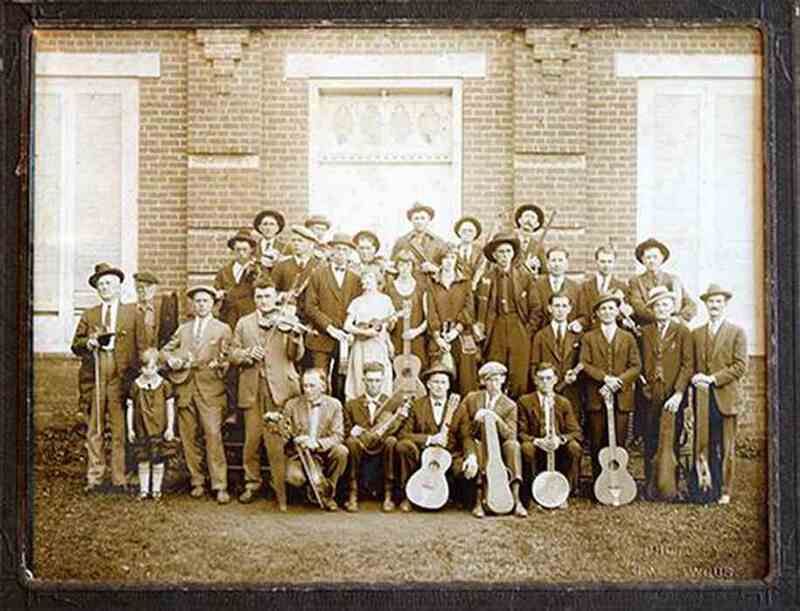 Clarence "Tom" Ashley began performing at medicine shows in the Southern Appalachian region as early as 1911, and gained initial fame during the late 1920s as a solo recording artist. He was "rediscovered" during the folk revival of the 1960s and spent the last years of his life playing at folk music concerts with the young Doc Watson, and two other Johnson County musicians, Clint Howard and Fred Price. The group appeared in Carnegie Hall in New York and at the Newport Folk Festival in Rhode Island. In 1933, Ashley made the first known recording of "The House of the Rising Sun", which he claimed he learned from his grandfather, Enoch. Ashley and his band helped to popularize the southern hymn, "Amazing Grace." Country music singer Roy Acuff once worked medicine shows with Ashley, who likely taught him "Greenback Dollar." Among other musicians directly influecned by Ashley are Bob Dylan, Jerry Garcia of the Grateful Dead, and Joan Baez. In March 2013, the LIbrary of Congress announced that the album, Old Time Music at Clarence Ashley's would be added to the National Recording Registry. 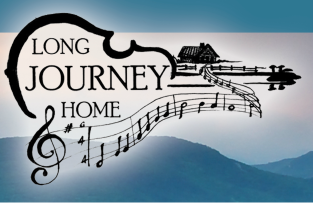 The album consists of a series of early 1960s recordings performed by Ashley and bandmates, Doc Watson, Clint Howard, Fred Price, Gaither Carlton, and Tommy Moore.